The domain within your query sequence starts at position 892 and ends at position 949; the E-value for the KASH domain shown below is 5.15e-31. The KASH (for Klarsicht/ANC-1/Syne-1 homology) or KLS domain is a highly hydrophobic nuclear envelope localisation domain of approximately 60 amino acids comprising a 20-amino-acid transmembrane region and a 30-35-residue C-terminal region that lies between the inner and the outer nuclear membranes (PMID:12169658). During meiotic prophase, telomeres cluster to form a bouquet arrangement of chromosomes. SUN and KASH domain proteins form complexes that span both membranes of the nuclear envelope. The KASH domain links the dynein motor complex of the microtubules, through the outer nuclear membrane to the Sad1 domain in the inner nuclear membrane which then interacts with the bouquet proteins Bqt1 and Bqt2 that are complexed with Bqt4, Rap1 and Taz1 and attached to the telomere (PMID:19948484). SUN domain-containing proteins are essential for recruiting KASH domain proteins at the outer nuclear membrane, and KASH domains provide a generic NE tethering device for functionally distinct proteins whose cytoplasmic domains mediate nuclear positioning, maintain physical connections with other cellular organelles, and possibly even influence chromosome dynamics (PMID:19687252). The KASH (Klarsicht/ANC-1/Syne-1 homology), or KLS domain is a highly hydrophobic nuclear envelope localization domain of approximately 60 amino acids comprising a 20-amino-acid transmembrane region and a 30-35-residue C-terminal region that lies between the inner and the outer nuclear membranes. 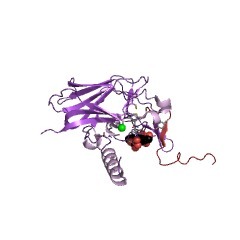 The KASH domain is found in association with other domains, such as spectrin repeats and CH, at the C terminus of proteins tethered to the nuclear membrane in diverse cell types [(PUBMED:10556085), (PUBMED:10878022), (PUBMED:12169658), (PUBMED:12408964), (PUBMED:15579692)]. Caenorhabditis elegans nuclear anchorage protein 1 (ANC-1). Drosophila Klarsicht (Klar), a protein associated with nuclei and required for a subset of nuclear migrations. Vetebrate nesprin-1, -2, -3 and -4 (also known as Syne1-4). They are components of the linker of the nucleoskeleton and cytoskeleton (LINC) complex, which plays critical roles in nuclear positioning, cell polarisation and cellular stiffness [(PUBMED:22945352)]. There are 2418 KASH domains in 2416 proteins in SMART's nrdb database. Taxonomic distribution of proteins containing KASH domain. This tree includes only several representative species. The complete taxonomic breakdown of all proteins with KASH domain is also avaliable. Click on the protein counts, or double click on taxonomic names to display all proteins containing KASH domain in the selected taxonomic class. Membrane proteins Bqt3 and -4 anchor telomeres to the nuclear envelope to ensure chromosomal bouquet formation. In many organisms, telomeres cluster to form a bouquet arrangement of chromosomesduring meiotic prophase. Previously, we reported that two meiotic proteins, Bqt1 and -2, are required for tethering telomeres to the spindle pole body (SPB)during meiotic prophase in fission yeast. This study has further identified twonovel, ubiquitously expressed inner nuclear membrane (INM) proteins, Bqt3 and -4,which are required for bouquet formation. We found that in the absence of Bqt4,telomeres failed to associate with the nuclear membranes in vegetative cells and consequently failed to cluster to the SPB in meiotic prophase. In the absence of Bqt3, Bqt4 protein was degraded during meiosis, leading to a phenotype similar tothat of the bqt4-null mutant. Collectively, these results show that Bqt4 anchors telomeres to the INM and that Bqt3 protects Bqt4 from protein degradation.Interestingly, the functional integrity of telomeres is maintained even when theyare separated from the nuclear envelope in vegetative cells. Bringing KASH under the SUN: the many faces of nucleo-cytoskeletal connections. The nucleus is the most prominent cellular organelle, and its sharp boundariessuggest the compartmentalization of the nucleoplasm from the cytoplasm. However, the recent identification of evolutionarily conserved linkers of thenucleoskeleton to the cytoskeleton (LINC) complexes, a family of macromolecularassemblies that span the double membrane of the nuclear envelope, reveals tightphysical connections between the two compartments. Here, we review the structure and evolutionary conservation of SUN and KASH domain-containing proteins, whoseinteraction within the perinuclear space forms the "nuts and bolts" of LINCcomplexes. Moreover, we discuss the function of these complexes in nuclear,centrosomal, and chromosome dynamics, and their connection to human disease. Role of ANC-1 in tethering nuclei to the actin cytoskeleton. Mutations in anc-1 (nuclear anchorage defective) disrupt the positioning ofnuclei and mitochondria in Caenorhabditis elegans. ANC-1 is shown to consist ofmostly coiled regions with a nuclear envelope localization domain (called theKASH domain) and an actin-binding domain; this structure was conserved with theDrosophila protein Msp-300 and the mammalian Syne proteins. Antibodies againstANC-1 localized cytoplasmically and were enriched at the nuclear periphery in an UNC-84-dependent manner. Overexpression of the KASH domain or the actin-bindingdomain caused a dominant negative anchorage defect. Thus, ANC-1 may connectnuclei to the cytoskeleton by interacting with UNC-84 at the nuclear envelope andwith actin in the cytoplasm.